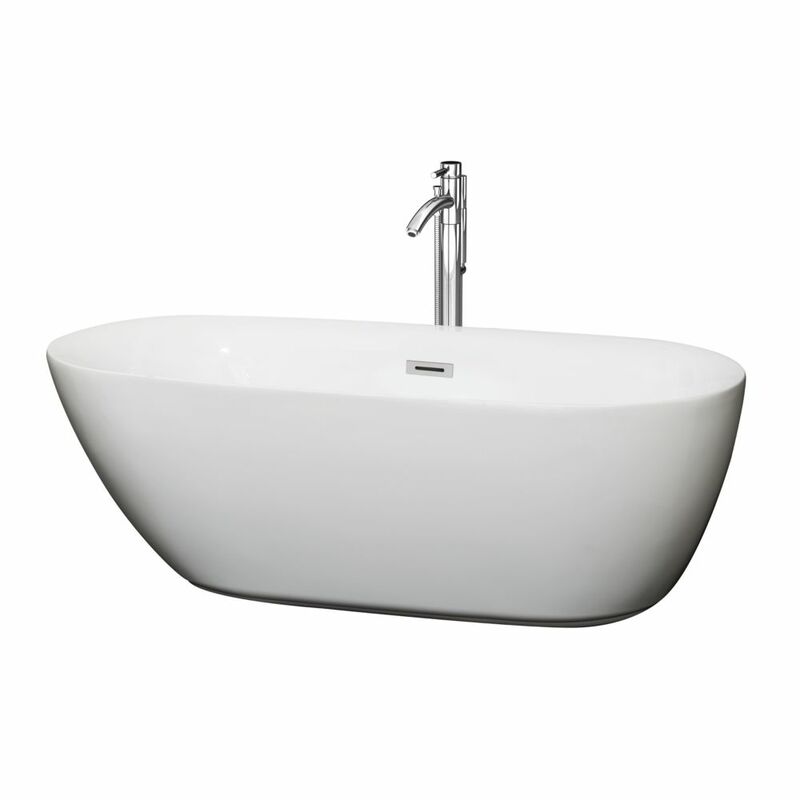 Soft, rounded design meets full-immersion soaking in the Melissa 5.42 ft. Centre Drain Soaking Tub in White. This freestanding bathtub has an oval shape with a different slope on each end to accommodate a laid-back or upright bathing position. Contemporary styling and soft lines contribute to the tub's modern aesthetic, sure to enrich your bathroom ambience and add a hint of serenity. The unit includes a floor-mounted single-handled chrome faucet along with chrome-finished overflow and drain outlets for a polished look. The acrylic construction is strong, light and warmer to the touch than typical steel or enamel tubs, allowing for easy installs and heat-retaining soaks. The Slipper 67 inch acrylic bathtub will surely be the center point of your bathroom with timeless styling and ornate tub feet. The extended gentle slope backrest allows you to lean back and enjoy a nice soak. Combo set includes tub, faucet, drain and supply lines. Pamper yourself. You deserve it. The Aria soaking tub will be your partner in indulgence. With its striking freestanding design and generous basin area, Aria provides a beautiful and luxurious centrepiece to your bathing area. Crafted from durable acrylic and featuring a seamless profile, Aria complements a wide range of bathroom styles. Perfect for deep soaking, the Emily 5.75 ft. Centre Drain Soaking Tub in White is deeper than standard tubs for full immersion. Acrylic construction is strong, light and warmer to the touch than typical enamel/steel tubs. Included drain allows for quick and easy drainage. Melissa 65-inch Acrylic Centre Drain Soaking Tub in White with Floor Mounted Faucet in Chrome Soft, rounded design meets full-immersion soaking in the Melissa 5.42 ft. Centre Drain Soaking Tub in White. This freestanding bathtub has an oval shape with a different slope on each end to accommodate a laid-back or upright bathing position. Contemporary styling and soft lines contribute to the tub's modern aesthetic, sure to enrich your bathroom ambience and add a hint of serenity. The unit includes a floor-mounted single-handled chrome faucet along with chrome-finished overflow and drain outlets for a polished look. The acrylic construction is strong, light and warmer to the touch than typical steel or enamel tubs, allowing for easy installs and heat-retaining soaks.